know it’s a mouth full to say but when you taste this magical creation you’ll never go back the old tradition smore ever again. Did I ever mention how fall is my favorite season of all? Well it is and it doesn’t have to be fall to enjoy these, these are definitely game changers that will keep the people wanting more. Using a hand mixer or stand mixer fitted with paddle attachment, cream together the butter and both sugars on medium speed until smooth. Add eggs one at a time until combined for 1 minute (*make sure eggs are room temp, take out an hour before making*). Scrape down the sides and bottom of the bowl as needed. Add peanut butter and mix on high until combined. Set aside. (*Don’t use natural style creamy peanut butter because it is oilier*). In a separate bowl, combine the flour, baking soda, baking powder, and salt. Proceed to add the wet ingredients and mix on low until combined. Dough should be thick and sticky. Cover dough and chill for at least 2 ½ hours (or up to 2 days in the refrigerator). Preheat oven to 350F degrees and line two large cookie/baking sheets with parchment paper (makes sure the cookies don’t stick to the pan). I used 1.5 Tablespoon of dough to form my balls (Optional, roll dough into granulated sugar). Place 1 ½ -2 inches apart on prepared baking sheets. Press fork into rolled balls to form a pattern (optional). Bake 11 minutes or until lightly browned on the sides, the center will look underdone and soft but don’t worry. Remove from oven and let cool for 10 minutes before transferring them to a wire rack to cool completely. Store cookies at room temperature for 1 week. This cookie recipe makes 30 cookies but remember we are making s’more sandwiches out of them so it really only makes 15 cookies. Once cookies are completely cooled, smear the delicious salted caramel chocolate on both ends of the cookies. After the cookies are all coated, start roasting the marshmallows over a gas stove, fire etc. (If under the age of 16 make sure you have parental supervision). 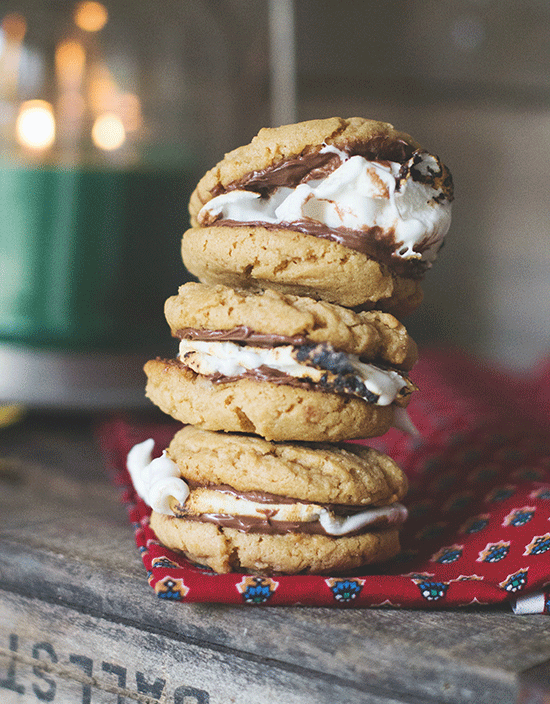 Place roasted marshmallow on top of a cookie and then squish the other cookie right on top. ENJOY!